As the translators emphasize, Abbot Suger wrote the Deeds rather than Life of Louis: this difference supposedly accounts for the absence of much of what might interest us, although it says more about what counts as a “deed.” There’s nothing, or virtually nothing, about Louis’s wife and children (so we see a distinction, I think, between private “life” and public “deeds,” even with a family as public as that of a King), nothing about his interests–apart from war-making–and thus nothing about, say, whether he read, or what he ate [although the evidence is: too much and too often (135)]. The contrasts with, say, Asser’s Life of Alfred are startling. It’s also illustrative to compare the Deeds of Louis to that of another young King, contemporary to Louis, who tried to bring (his own) peace to his disunified realm, namely, Arthur, as written by Geoffrey of Monmouth. Arthur handily defeats each of his enemies, and never has to fight anyone twice; Louis scrambles from place to place throughout his reign, killing his vassals’ men and having his killed in turn, sometimes winning, sometimes losing, and only very rarely, and only at times of weakness, negotiating a peace; at least he doesn’t fall, as Chrétien’s Erec does, to idleness (61). The differences can be blamed on the difference between Norman Kingship in England (which I believed attained a monopoly on legitimate violence quickly) and the French Capetian Kings, who only began to attain a monopoly on legitimate violence during Louis’s reign. Note, then, that throwing down tyrants is among Louis’s duties. We would expect the King to be the sole possible tyrant of France, but this would mean mistaking the feebleness of a medieval French King for the grandeur of Louis XIV. What does Louis actually accomplish? Toward the end of his reign, he’s able to take a host from Paris to Clermont-Ferrand without being accosted and to impress the Aquitaine Duke so much that he gives his daughter, Eleanor, to Louis’s son in marriage; earlier, he assembled a host to meet the German emperor, who decides that invading France would be too much trouble. 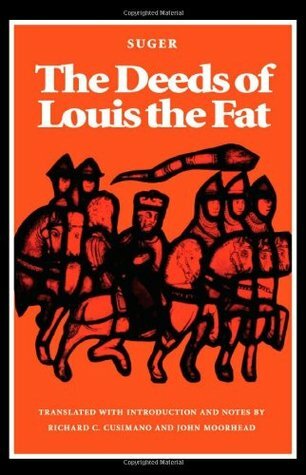 Louis’s greatest victories, then, are when he intimidates rather than kills (131-32). To be praised for its lively translation, deep notes, and a very thorough map. This entry was posted in Book Reviews, MedievalBlog and tagged historiography by medievalkarl. Bookmark the permalink.